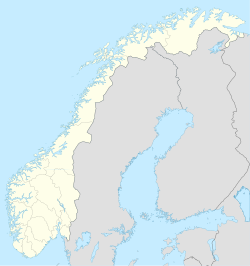 Furuflaten (Norwegian) or Vuošvággi (Northern Sami) is a village in Lyngen Municipality in Troms county, Norway. The village is located along the Lyngen fjord. Furuflaten is located at the mouth of the Lyngsdalselva river, about 15 kilometres (9.3 mi) south of the village of Lyngseidet and about 54 kilometres (34 mi) straight southeast of the city of Tromsø. The 0.42-square-kilometre (100-acre) village has a population (2018) of 269 which gives the village a population density of 640 inhabitants per square kilometre (1,700/sq mi). ^ a b c Statistisk sentralbyrå (1 January 2018). "Urban settlements. Population and area, by municipality". ^ "Furuflaten, Lyngen (Troms)". yr.no. Retrieved 2018-08-07. This Troms location article is a stub. You can help Wikipedia by expanding it. This page was last edited on 5 December 2018, at 00:47 (UTC).